Gyms are funny places. Those who are into working out regularly love their gym as much for the camaraderie as for the large selection of workout equipment available. Those who aren’t fitness warriors, though, often fear going to a gym or even a spin class; some are self-conscious about their relative training inexperience, while others are frankly intimidated by a large facility filled with those who are in better shape. When those in the second group decide that it’s time to exercise on a regular basis, they’re more likely to buy their own exercise machine than to join a gym. And the equipment they choose most frequently is an exercise bike – more bikes are purchased each year than elliptical machines and treadmills combined. Buying an exercise bike isn’t quite as intimidating as joining a gym as a newbie, but it’s close. Upright, recumbent, spinning, folding – there’s a lot to learn before you can narrow down your choices. And if you’re just dipping your toes into the exercise waters and are confronted with enormous price tags you may decide to put your shoes and socks back on and walk away rather than cycle. Never fear – we’re here to help. We’ve researched a huge group of bikes in much more reasonable price ranges, which are perfect for a first or second exercise bike. And after we give you a crash course on what you should know before setting out on a buying expedition, you can see our exercise bike reviews which will help you pick the best exercise bike for your needs. 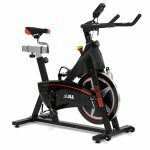 The first thing we should do is give you a quick rundown of the different styles of exercise bikes you can choose from. These are the most popular exercise bikes, probably because they give their rider the closest experience to riding a familiar outdoor bicycle. As you would assume, you sit upright on these machines with the pedals right under the seat and the handlebars easy to reach. You can stop pedalling at any time if you need a break, but the exercise is comfortable for long periods of time once you build your stamina a little and become fit. Upright bikes can give you a very good cardio workout, depending on how strenuous a program you follow. On a recumbent exercise bike, you’re actually in a reclining position with your feet placed on pedals located in front of you as you cycle rather than underneath you. Also notable is the fact that there are no handlebars, just grips at your side if you want to brace yourself (although many people prefer to read or surf their phone while peddling). Recumbents are the most comfortable bike to ride and are perfect for people with back problems or older riders, but the workout isn’t as thorough as with upright or spinning bikes. (The reviews that follow don’t include recumbent bikes, which are normally more expensive). The easiest exercise bike to get started with, and usually the least expensive, is an upright bike. So that’s what we’ll focus on for the rest of this guide. Once you’ve gotten some experience with an upright, you may want to explore the possibility of a recumbent or spinner; you can also try them out at a gym, if you can work up enough nerve to visit one for your training. When choosing an exercise bike, there are several basics to consider. Each cycle will have a maximum weight limit it can support, and each will have a different footprint (that is, how much space it takes) when it’s set up. If you’re limited by the amount of space you have for your bike, the footprint is an important consideration and you may also want to consider folding bikes or ones with wheels, which can be put away or moved when not in use. We’ll only mention the footprint in our reviews if it’s vastly different than “average” for the category. Noise can also be a factor; the resistance that you cycle against is created by different mechanisms depending on the model, and some methods are noisier than others. Fans creating air resistance, or flywheels driven by belts or bands, are most commonly seen on inexpensive bikes. For obvious reasons, the ones with fans tend to create the most noise. Magnetic resistance bikes are quieter and provide greater control over the variety of fitness programs and courses you can follow, but they’re often a bit more expensive. It’s important to be able to control the resistance you’re pedaling against; higher-level bikes will let you adjust it automatically from your console, but most lower-level ones require manual adjustment. The final consideration is the level of complexity of the bike’s display and control console. Most will show you information like your speed, time and distance ridden, and calories burned, and will have at least a few preset programs for your ride. Higher-priced models will have a plethora of options including a heart rate monitor that attaches to your chest rather than one that takes reading from the handlebars, and the ability to download your session information to a phone or tablet. This foldable upright bike packs a lot into a small package that is reasonably priced. It’s sturdier and more comfortable than similar models we’ve seen, folds up easily (although you’ll have to take the console off in order to do it), and features quiet magnetic resistance with eight manually selectable levels. Experienced riders may feel there’s not enough resistance, but that makes it ideal for those just starting out. Speaking of the console, it’s full-featured with the LCD display showing time, distance, speed, calories, and pulse thanks to the sensor grips on the handlebars. The nominal weight limit is 100kg, but it feels like this Ultrasport should be able to handle quite a bit more. We think its features and solid build make it a brilliant bike for the money. We’ll make this one short and sweet. The F-Bike Heavy is the same as the F-Bike except that (as you might guess from its name) it’s 30kg heavier and has a nominal maximum user weight of an additional 30kg. Otherwise, you get all of the same terrific features. It’s also expensive but a good deal – unless the extra weight isn’t desirable because you’ll be taking it up and down a lot. Another fantastic exercise bike. The Fit4Home is a small and lightweight bike, but doesn’t fold. It has most of the basic features you’d expect: adjustable handlebars, seat and foot straps, and a decent LCD console which shows speed, distance, time and calories burned. The Olympic Belt, true to its name, works on a direct belt drive system requiring manual adjustments; it’s a little noisier than the Ultrasport models with their magnetic resistance, but not objectionable. Don’t expect this bike to be anywhere near as sturdy as the Ultrasport models, and you’ll want to add a seat cushion because the seat isn’t particularly comfortable, but if you have a small budget for your exercise bike this one will do the job. Maximum user weight is 100kg. Those who don’t need a foldable model will want to consider this upright exercise bike. Unlike other bikes that only come with a magnetic resistance, the IC300 is just like riding a real bicycle because it is also equipped with a direct driven belt and a 3 piece crank system pedal (which also makes it much more durable). You can adjust the level of resistance to your preference if you want to make things a bit more challenging. The JLL IC300 Pro is equipped with a 6-function monitor which counts time, speed, distance, calories, and pulse through the built-in sensors in the handlebars. Another thing we like about this exercise bike is the fact that even if it isn’t foldable, you can still easily transport it from one room to another because of the built-in wheels. We recommend the Beyondfashion only because it’s the cheapest upright, non-foldable bike you’ll find for beginners – and because it’s by far the brightest purple bike you can find. It’s not overly sturdy or well-built and it can be difficult to assemble. The resistance is manual-adjust, the display is functional but not terrific, and the max weight level is 110kg. 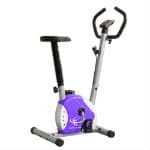 Those who want to really get into shape should look elsewhere; those who want a lightweight bike for casual exercise in front of the TV – and really, really like purple – may find this worth checking out for a budget price. This model is comparable to the Ultrasport F-Bike. However, you may only want to consider it if you are already in shape, since its maximum weight capacity is just 80kg. That would lead you to believe that the We R Sports bike is not as sturdy as the F-Bike and you’d be correct, but it should hold up fine in most situations. 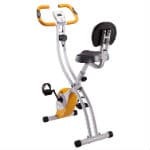 This is a magnetic resistance model with eight manually-set levels, an adjustable seat and fixed handlebars, and the console has six display functions including handlebar-pulse readings. This is a good value at a moderate price level, but you might do better with the Ultrasport if it fits your budget. Whether you’re new to the fitness bandwagon or have been at it for years, the DKM AM-E exercise bike won’t disappoint. It has 32 levels of resistance so you have full control over how easy (or brutal!) you want your workout to be. You can monitor your stats through a blue LCD display which will show your RPM, speed, pulse, recovery, time, and calories burned. You’ll also be able to keep track of your heart rate through the pulse rate sensors embedded in the handlebars. If you’re new to cycling, you can use any one of the 12 pre-set programmes in the machine but if you’re already a PRO, you can customize your routine through the user mode. This is another folding bike that’s similar to the Ultrasport, but sturdier than the We R Sports model. Manually-adjustable magnetic resistance, adjustable seat and LED display with five functions give you everything you really need for light workouts, and the max weight is higher than the We R Sports bike, at 100kg. We’d probably choose the XS if we wanted an Ultrasport alternative with an attractive price tag. If you were intrigued by the Olympic Sports Belt Bike but disappointed that it didn’t fold, this might suit your purposes. It provides a relatively gentle ride so it’s not for those who want to really burn rubber (or in this case, carpet), but the crank/flywheel resistance system is adjustable to eight levels. 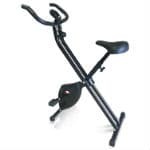 The machine folds up easily and is quite lightweight, has adjustable handlebars and a five-function LCD display, and is rated at a max weight of 100kg. It’s moderately priced and perhaps a bit more than it should be compared to some of the alternatives, but it’s not bad for a sturdy beginner’s exercise bike. If you don’t have a lot of space in your home but would like to get some upper body workout in your cardio routine, our final product is your best bet. 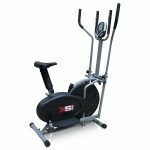 The XS Sports Pro is an exercise bike and an elliptical machine in one! The resistance on this machine can be adjusted from high to low to suit your exercise regimen. It can also be pedaled backwards if you want to workout your hamstrings. You won’t have to make adjustments or remove handles and parts when you want to switch from bike to elliptical so no need to worry about losing your momentum when you want to workout your upper body. The XS Sports Pro is also equipped with an LCD display which will show you your speed, time, distance, and pulse rate through the sensors in the handlebars. Exercise bikes are so popular because they give you an effective cardio workout and can build muscles without requiring you to “learn” any new skills – just about everyone knows how to ride a bike, after all. And as you’ve seen, you don’t have to spend a lot to get a lot. All of these models (with the exception of the JLL IC300, which is the “Mercedes” of this list) sell for easy-to-handle prices, but will let you get into shape and stay there without having to hit the gym. We’ve focused on machines which provide the minimum features necessary, like a decent LCD monitor and adjustable resistance levels. 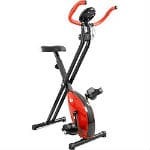 However, be conscious of the fact that most of the exercise bikes we have featured are designed for lower-level workouts; if you want a real challenge, you should spend the extra for the IC300 or take a look at more expensive models. 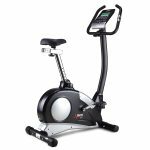 For most people, though, any of these exercise bikes will provide the aerobic exercise they need without breaking the bank. And the bikes are all inexpensive enough that you can easily use one for a year or two to get acclimated to the exercise regime, and then move up to the next level. 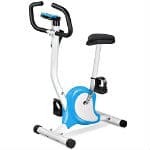 We hope since reading our exercise bike reviews you will be able to confidently make the best exercise bike buying choice. Can you advise the best excercise bikes for a 4ft 11 person please? I’ve noticed some reviews mention that some bikes are not suitable for a shorter person. Hi Sally. 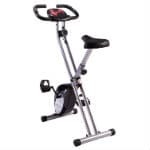 Look for an exercise bike that has an adjustable seat and/or handlebars. You may want to check out the fourth in our list: JLL IC300 PRO. It has an adjustable seat and handlebar to give you a more comfortable experience.